He is the world's most wanted man. Hunted for past and ongoing crimes of the most gruesome nature. In 2014 he formed the Caliphate that the Islamic State is now known by. 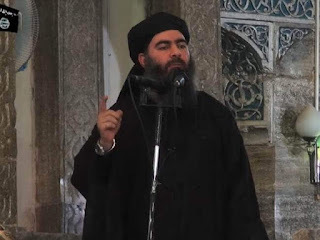 But recent Unverified reports from a Syrian state run TV claim that ISIS leader Abu Bakr al-Baghdadi has been killed in an air strike in Raqqa Syria. Of course this is not the first time that the terrorist leader has been reported killed, but many are claiming it's for real this time. The man who once infamously escaped Iraqi special forces by minutes, by crawling through a trap door was reportedly killed in the stronghold of Raqqa which was bombed heavily overnight on Saturday, local time, with the terrorist group’s Amaq news agency revealing the extent of damage. Al-Baghdadi had a price of $34 million dollars on his head.